The Pizza Files: The Pizza Files 2009 Summer Binge, a look back. 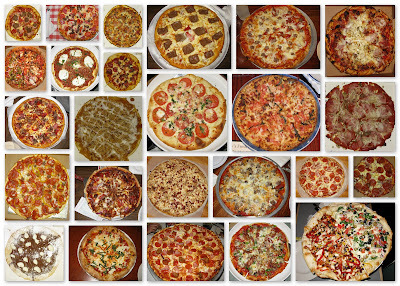 The Pizza Files 2009 Summer Binge has been over for a couple of weeks now, and I've had some time to think about all 25 of those pies and the 17 pizza joints they came from. My plan was to hit 8 different pizza places in a 10 week period, but The Binge took on a life of it's own and I nearly doubled that goal. I won't name all 17 pizza joints here, but will name a couple of the standouts. Erio's Ristorante, some of the Best pizza I have ever had! Frank and Helen's Pizzeria, making pizza since 1956. It was under my nose for years, but I just discovered it. Napoli Pizza, one of my all time favorites was the first stop on the binge, but sadly closed it's doors for good a week later. To see all of the pizza joints I visited follow this Link. Will there be a 2010 Binge? If my wife and daughter go on a extended summer vacation and leave me at home you can count on it. I need to thank all of the Pizza Eaters who helped me to eat and PAY for all of those pizza's.